Only 40 percent larger in diameter than the Moon, Mercury is the closest planet to the Sun, and its sunlit surface is hot enough to melt lead. The planet is so small and so far away from Earth that it was only a dull white blur in telescopes before the Space Age. Its surface finally was revealed during three flybys of a single space probe, Mariner 10. Mercury is a planet much like the Moon. It has no atmosphere, and its surface is covered with circular im pact craters and huge, round basins. 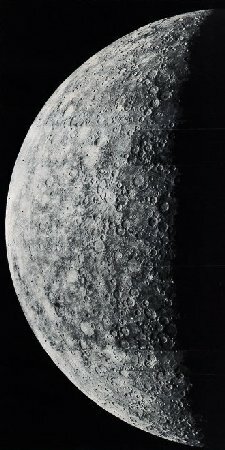 Most of Mercury looks much like the lunar highlands; apparently it was subjected to the same bombardment that shaped the Moon in primordial times. Yet Mercury is different. It seems to lack the dark deposits of lavas that engulfed much of the Moon between 3 and 4 billion years ago. Unlike the Moon, Mercury has great cliffs, thousands of kilometers long, that may be wrinkles formed as the planet cooled and shrank. Mercury is denser than the Moon, and it seems to have a large iron core, the source of a weak but detectable magnetic field, a feature the Moon lacks. The planet Mercury, once only a white blur in Earth bound telescopes, reveals a moonlikeface to the cameras of Mariner 10. 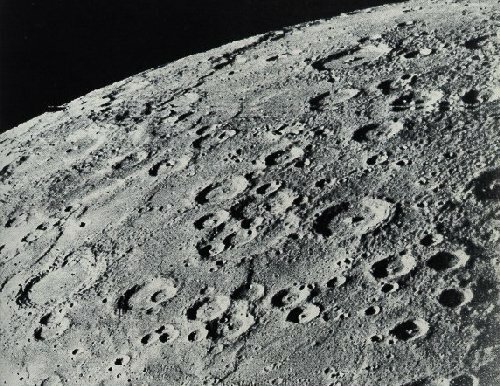 The heavily cratered surface seen here resembles the highlands of the Moon; the largest craters are up to 200 kilometers (125 miles) in diameter. The surface of Mercury, like that of the Moon, displays the effects of meteorite bombardment, suggesting that such impacts shaped many of the terrestrial planets. This mosaic was assembled from eighteen separate pictures, snapped at a distance of 200,000 kilometers (125,000 miles). Mercury is a scorched, primordial world which must retain traces of how planets were formed in a part of the solar system remote from the Earth and Moon. But we cannot reach it yet for detailed exploration. Deep in the gravity field of the Sun, Mercury lies beyond the reach of even today's most advanced spacecraft. To send orbiters and landers there, more powerful interplanetary spacecraft will be needed. Until then, Mercury waits just out of reach, its secrets baking in the light of a huge and searing Sun. In this close-up viewfrom Mariner 10, an airless, cratered surface is revealed as it might appear to an astronaut in orbit around Mercury. Surface temperatures can reach 425° C (about 770° F) in the searing light of the nearby Sun. The irregular dark line on the distant horizon is a unique feature of Mercury, a huge scarp (or cliff), several kilometers high and several hundred kilometers long, that may have been formed as the young planet cooled and shrank. This picture was taken from 77,800 kilometers (48,000 miles) as Mariner sped past Mercury; the distance along the lower edge of the picture is about 580 kilometers (360 miles).